“Stairway to Heaven” by Led Zeppelin is one of the most popular songs of all time on the guitar and for good reasons. Not only is it a great piece of music to listen to, but it’s also a goldmine of guitar chords and techniques. In it, you hear both 6- and 12-string guitars, both acoustic and electric. Some parts are picked and arpeggiated, some are strummed, and still others are fingerpicked. Other features include CAGED chord forms, chord inversions, voice leading, added chord tones, modal interchange, pedal tones, riffs, and guitar solos. The opening features chords connected by descending chromatic voice leading. On the 4th string beginning at the 7th fret, you move down in half steps to the 2rd fret. 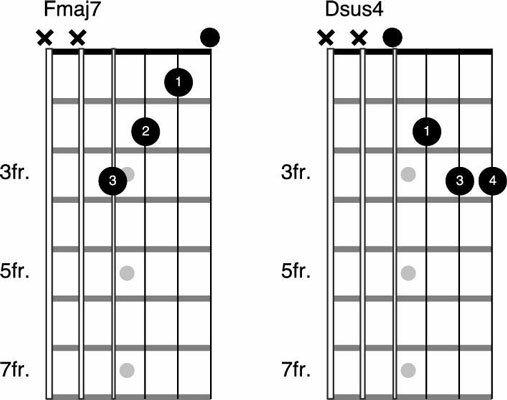 This series of changes, which is similar to the one shown here, uses some shapes from the CAGED chord system. Around the 2:14 mark, a new interlude section features layered, strummed guitars, including a 12-string. You also hear some more added chord tones and, in the Em/D-D-C/D changes, the use of pedal point with D sustained in the bass position of each chord. Here is an example. The extended guitar solo section is based on Am-G-F in the key of A minor, as shown here. Led Zeppelin’s guitarist Jimmy Page positions himself in familiar A minor pentatonic patterns but adds a minor 6th, F, to the scale to outline the F chord in the underlying progression.